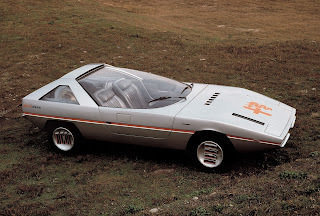 The Alfa Romeo Caimano is a concept car designed by Giorgetto Giugiaro of ItalDesign and presented at the Turin Motor Show in 1971. Most sriking feature is an unusual dome-windshield, also incorporating the doors. The car is exhibited at the Museo Storico Alfa Romeo. Last updated on 12 August 2013 at 09:16.